Last weekend I took a broom ride to Rehoboth Beach's Sea Witch Festival parade for the first time ever. I've seen the sea witch balloon mascot in ads for years, but didn't realize there were so many other billowing balloons in the procession! The seahorse balloon was my favorite, but I couldn't resist tying the three Halloween balloons together into an animated gif. You seem to find all kinds of cool things to do! Those parade balloons are wicked cool! Those animated balloons are awesome Kristin! My favourite is the sea horse. Thanks for hosting. The scale of those things are amazing! I love the witches face! 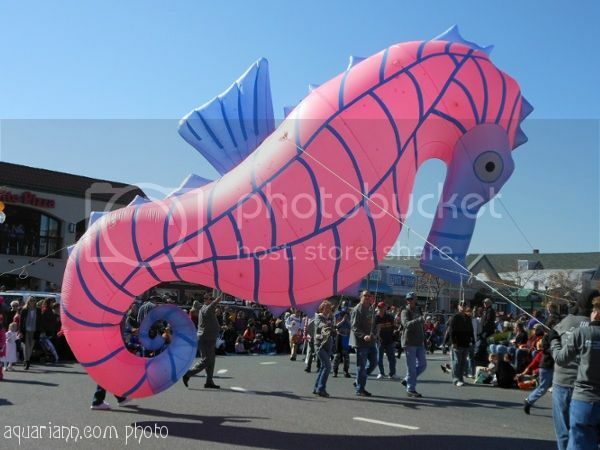 I really love that seahorse balloon! what a fun festival. I would of liked it myself! Great balloons. I really like the seahorse too and the witch. Ooh! Those are so neat!! I would have loved to have been there to see this. I like that witch the best! But they are all great! Oh! i just got reminded of my childhood when I used to see such things! Next year we're going for sure. I really want to see the dog parade, too. Oh, that looks like a lot of fun! Great photos. I would to see more of the Sea Witch Festival. Cool balloons! I like that witch the best!! Fun! The seahorse is so whimsical.